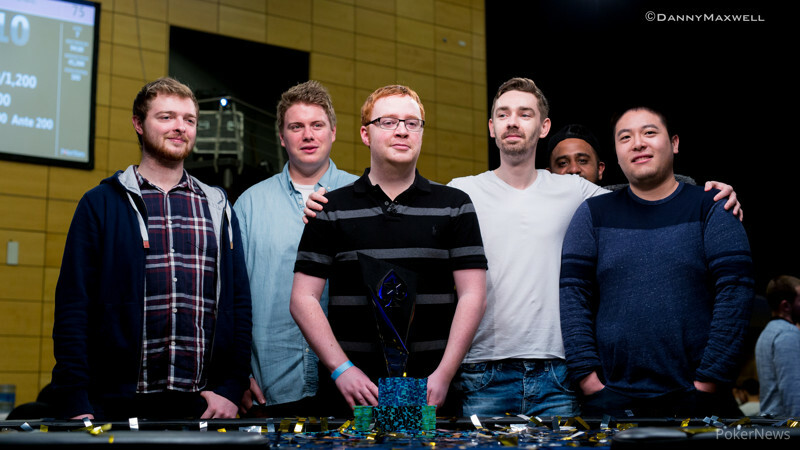 The final day of the 2015 PokerStars.com EPT Season 12 Malta Main Event started out with just six players, all competing for that first-place prize of over €600,000. The action was extremely fast paced, with players busting out almost every other orbit. Before the first break the tournament was down to just four players and it was Sam Greenwood who was the first to go. He became the shortest stack after missing a flush draw with queen-three suited. He eventually got it in with king-jack suited against Niall Farrell's button raise. Farrell had ace-seven suited and the ace on the turn left Greenwood drawing dead. After already finishing sixth for €110,590 in the €25,000 High Roller earlier this week, he now had to settle for €125,660 for his sixth-place finish in the Main Event. Rainer Kempe got eliminated eight hands later. Farrell, who had already played his fair share of hands at the final table by then, raised it up under the gun. Kempe looked down at queens in the cutoff and three-bet. Farrell four-bet shoved and Kempe called it off. Farrell had pocket aces and five community cards later Kempe hit the rail. After finishing fifth in the EPT 12 Barcelona Main Event for €320,400, Kempe, who became just the eighth person to make back-to-back EPT Main Event final tables, exited again fifth place, this time for €161,340. 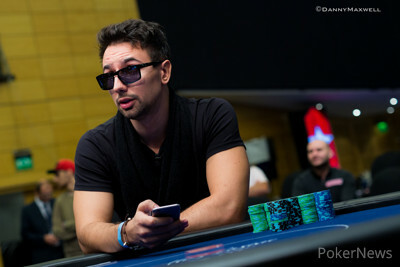 It wasn't long after the first break was done that Giulio Spampinato made his exit in fourth place. The Italian qualifier, who's biggest cash in his poker career was $17,000 before this event, reshoved on Farrell's button open with ace-eight. Alen Bilic woke up with pocket tens in the big blind and made the call, which prompted Farrell to get out of the way. A board full of blanks followed and Spampinato collected €265,840 for his performance. Two hands later, Jaroslaw Sikora got into a blind battle with Farrell. Sikora limp-shoved for 1.585 million with ace-ten from the small blind. Farrell again had a big hand and called with ace-jack. Another black board failed to improved either player and Sikora made his way to the payout desk to collect €265,840 for his third-place finish. The two remaining players agreed to a deal within minutes after Sikora's bust out. Farrell, who held a slight chip lead, locked up €444,300, Bilic guaranteed himself €440,000, and the two agreed to play for the trophy and €90,000. Despite the fact a deal was made, it was nowhere near over. There was still lots of money on the line, and the stacks were deep for both players. The two started out almost even, and the chip lead shifted a couple times before Farrell won a couple medium pots in a row and distanced himself from Bilic. In Hand #98 of the final table, Farrell three-bet seven-six off suit and Bilic called with seven-eight suited. The flop came and Farrell bet 400,000 into a 1.4 million pot. Bilic called and then called a 1.3 million bet on the turn, which paired his eight. The river was a blank and Farrell shoved all in on a total bluff. Bilic folded the best hand and was left short after that. Two hands later it was all over as Bilic and Farrell clashed on a board of . Bilic had missed with his but bluffed all in for the size of the pot. Farrell called with bottom two pair and just like that the EPT Main Event final was over after exactly 100 hands! Farrell was the newest EPT champion and proud owner of €534,300, while Bilic had to settle for second, earning €440,000. That does it for our coverage from the Main Event. However, you can still follow our coverage from the €10K High Roller by clicking here. Hand #100: Bilic raised to 250,000 with the , and Farrell called holding the . The flop saw Farrell check-call a bet of 300,000, and the peeled off on the turn. Farrell checked his two pair, Bilic bet 650,000 with his open-ended straight and flush draws, and Farrell check-called to see the river. Farrell checked once again, and Bilic, who missed, moved all in for his last 2.505 million. Farrell asked for a count, gave it some thought, and made the call to clinch the title. As part of the heads-up deal, Bilic will take home €440,000. Hand #96: Alen Bilic with on the button raised to 250,000. Niall Farrell with made the call. on the flop and Farrell check folded to the 300,000 continuation bet. Hand #97: Niall Farrell took down the blinds and antes raising . Bilic folded. Hand #98: Alen Bilic opened for 250,000 from the button. Farrell three bet to 725,000 holding and Bilic added the needed chips to call. The flop came and Farrell fired 425,000 into the 1,470,000 pot. Bilic just about instantly called. The hit the turn, pairing Bilic. Farrell bet 1,300,000 into the 2,320,000 pot. Bilic called again, growing the pot to 4,920,000. The on the river changed nothing but Farrell moved all in for effectively 3,980,000 nonetheless. Bilic folded the best hand, Farrell's big bluff worked. Hand #99: Niall Farrell raised to 250,000 with the and Alen Bilic called with the . The flop saw Bilic check, Farrell bet 175,000, and Bilic fold. Hand #88: Alen Bilic gave Niall Farrell a walk. Hand #89: Farrell looked down at the and raised to 250,000. Bilic three-bet to 725,000 with the , Farrell pushed back with a four-bet to 1.5 million. Bilic folded. Hand #90: Bilic raised to 250,000 with the and Farrell three-bet to 725,000 with the . Bilic folded. Hand #91: Farrell raised to 250,000 with the and Bilic called with the . The flop gave Farrell two pair, and he bet 300,000 after Bilic checked. It did the trick as Bilic folded. Hand #92: Bilic raised to 250,000 with the and Farrell folded. Hand #93: This hand did not broadcast due to side interview on EPT Live. Hand #94: Bilic raised to 250,000 with the and Farrell folded offsuit. Hand #95: Farrell raised to 250,000 with the and Bilic three-bet to 725,000 with the . Farrell released. 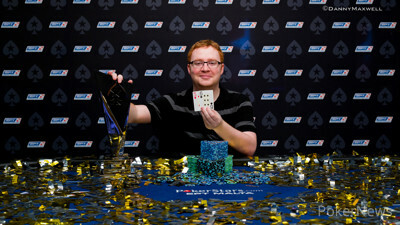 Hand #83: Niall Farrell had again and opened for 250,000. Alen Bilic had in the big blind and he called. The flop brought just over cards for both: and Bilic and Farrell checked. The fell on the turn and both players checked again. They did so to on the river and the pot went to Farrell. Hand #84: Alen Bilic opened for 250,000 and Farrell three bet to 725,000 with . Bilic folded. Hand #85: Niall Farrell open folded, Bilic received a walk with . Hand #86: Bilic opened with and Farrell called with . The flop came and saw both players check. They did so to on the on the turn. The completed the board and again both players checked. Bilic won it with ace-high. Hand #87: Farrell raised it before the flop and Bilic called. On a flop of Bilic check raised the 300,000 continuation bet to 825,000 with . Farrell had and called. The fell on the turn and Bilic picked up the heart draw and extra gutshot. Bilic bet 1,125,000 into the 2,170,000 pot. Farrell tanked long and hard and eventually folded. Hand #75: Niall Farrell raised to 250,000 with the and Alen Bilic folded with . Hand #76: Bilic raised to 250,000 with the and Farrell called with the . The flop saw Farrell check-fold to a bet of 300,000. Hand #77: Farrell raised to 250,000 on the button and Bilic folded. Hand #78: Bilic looked down at the and raised to 250,000. Farrell called with the and the flop came down . Action went check-check, the peeled off on the turn, and Farrell led out for 175,000. Bilic folded. Hand #79: Farrell raised to 250,000 with the , Bilic called with his , and the flop fell . Bilic checked, Farrell did too, and the appeared on the turn. Bilic bet 350,000, Farrell called, and the completed the board on the river. Bilic bet again, this time 900,000, and it was enough to get Farrell off the best hand. Hand #80: Bilic raised to 250,000 and Farrell, who looked down at the , three-bet to 725,000. Bilic folded. Hand #81: Farrell gave Bilic a walk. Hand #82: Bilic raised to 250,000 with the , Farrell three-bet to 725,000 with the , and Bilic called to see a flop. Farrell bet 425,000 and Bilic folded. Hand #71: Farrell opened with for 250,000 and Bilic called with . The flop came and Bilic check folded to Farrell's 275,000 bet. Hand #72: Alen Bilic made it 250,000 with and Farrell folded his seven-five off suit. Hand #73: Farrel folded from the button. Bilic had and received the blinds and antes. Hand #74: Alen Bilic with made it 250,000 and Farrell called with . The flop came and Farrell check called a bet of 300,000. The on the turn saw Farrell check call another bet after some tanking. This time the bet was 625,000, growing the pot to 2,370,000. The hit the river and it went check check. Farrell took it down with his rivered two pair and Bilic mucked. Hand #69: Niall Farrell raised to 200,000 with the and Alen Bilic called with the . The flop saw both players checked, and the dealer burn and turn the . Bilic bet 250,000 with bottom pair, Farrell called with nines, and the completed the board on the river. Bilic bet 550,000, and Farrell, who had improved to two pair, took his time before raising to 1.7 million. Bilic wasted little time in folding. Hand #70: Bilic raised to 200,000 with the and Farrell called with the . When the flop came down , Farrell checked, Bilic bet 225,000, and Farrell called to see the turn. Farrell checked, Bilic bet 525,000, and Farrell made the call. When the appeared on the river, Farrell checked for a third time and Bilic bet a modest 30,5000. Farrell called and took down the 2.53 million pot. The final two players are now on a 20-minute break. The Final Six Battle It Out at 2 p.m. The March to the Final Table Begins Today!